“Finally!” is the phrase that comes to mind. Finally, we have a great DC Universe film. Finally, we have a female-led superhero film. Finally, we have a Wonder Woman film. Ever since Warner Brothers passed on Joss Whedon’s take on the third part of DC’s trinity, we’ve been denied this movie. After dazzling us in Batman v Superman: Dawn of Justice, Gal Gadot has her own film, and it’s brilliant. Gadot is radiant as the hero of the piece – kick-arse, compassionate, naïve, determined – and they’ve paired her with a fantastic script that results in the best superhero movie we’ve seen in years. Beginning with her upbringing on Themyscira, we get see her meet Steve Trevor (Chris Pine) and travel to the world of men, which is currently in the grip of the Great War. I really can’t stress enough how good Gadot is in the role. Every single movement she makes, every small expression conveys a complex yet powerful hero. This is probably my favourite Chris Pine performance too. I sympathised with him a lot more than his lead roles (Star Trek, Jack Ryan: Shadow Recruit) which have a tendency to be a little bland. Robin Wright and Connie Nielsen play kick-arse Amazons Antiope and Hippolyta, whilst Saïd Taghmaoui, Ewen Bremner and Eugene Brave Rock shine as a motley crew of soldiers-for-hire. The script arguably contains elements of both Captain America (the World War setting) and Thor (the fish-out-of-water comedy), but it’s better than both of those films. Each of the soldiers-for-hire, for instance, have depth, and it’s worth reiterating just how unique a hero Wonder Woman is. There are elements of “Buffy the Vampire Slayer”, but she was always a reluctant hero. Diana relishes her task, despite the odds. Patty Jenkins’ direction is spot-on, and whether it’s the big action set-pieces or the quieter moments, both the narrative drive and the passion of the characters really hits home. 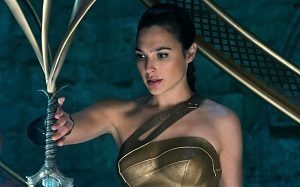 The stunt work is fantastic – Diana’s fighting style exudes power and is incredibly cinematic. Every single comedic beat lands too. The only disappointing aspect of the film would be the visual effects. The first ten minutes feature some woeful moments of digital trickery (that were perhaps last-minute additions), but thankfully they soon reach the standard you’d expect in a $149 million film. Rupert Gregson-Williams’ score works well, yet only truly came alive for me when Hans Zimmer’s main theme appeared. It’s absurd not only that we haven’t had a female-led superhero film since 2005’s Elektra, but also the fact that Marvel are 15 movies in and still haven’t made one. Whilst we had to wait way too long for this film, the good news is that Wonder Woman is awesome. If you only see one superhero movie this year, make it this one. This entry was posted in Film Reviews and tagged Action/Adventure, Comedy, Comic Book, Period Drama by Stuart Wilson. Bookmark the permalink.